Pioneering brands are building post-product customer relationships in the social channel because they realize that product features are copied easily and serve as weak differentiators, which leads to pervasive commoditization. Moreover, people’s preferences for individualized information dealt mass media a lethal blow, and products firms will have a similar fate. Here’s why products will become extinct and how to guide your brand in building post-product customer relationships and profits. I have predicted for years that mass customization would be the fate of “products,” and social business is bearing this out in spades, so here I’ll delve into how impersonal “products” will be rejected by customers in 5-15 years. More important, CMOs and brand stewards who appreciate this transformation will enjoy unusual advantage, and smart ones will prepare for it now. Brands that don’t get it will simply perish, and no one will even notice except their producers and vendors. Just think about the local papers and TV stations you have known. This is Part One of the Social Channel Trilogy. It will help you learn how to “de-productize” your business orientation, so you can build breakthrough brand strength by practicing social business at a whole new level. The trilogy reveals how companies can combat commoditization by tapping socially-powered innovation. Do you realize that products, as we think of them today, never existed before 1750? I predict that brands built on mass-produced impersonal objects will die completely by 2050—and many will perish decades earlier. Of course, mass production itself will continue, but its products will no longer support the concept of a brand as we think of it now. This will happen because impersonal products are not in harmony with people, who prefer things to be individually made for them. Social business is a key enabler of this trend. 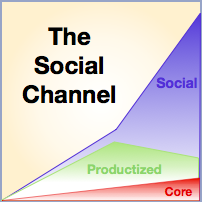 Social technologies are an economical means for “makers” and “users” of things to communicate. Here I’ll give you the perspective to think about mass customization and some general recommendations for acting now to get ahead. As the seeds of the future were planted in the past, please bear with me for a short synopsis of humans’ experience with products. Prior to the Industrial Economy (its industrial revolution began in 1750), people made everything, usually to order. There were no products as we think of them now; everything was a service. People served other people. Think about that a minute. We’re going back there, but differently. Every place in the world had its distinct style of dress, foods, customs, etc. Even when there were duplicate “service providers” (i.e. bakers, shoemakers), each one gave something of him/herself to the service, so “differentiation” was baked in ;^). Personalized service is the rule people have always lived by. Reputation was core to differentiation. It is in our DNA to appreciate “the personal touch,” even though that can be positive or negative. The past 300 years will prove to have been an exception. The Industrial Economy has enabled people to create unprecedented wealth, so it has had a profound impact on our minds and aspirations. It works by mechanizing work, but that requires standardization and depersonalization. Machines harness physical power to transform raw materials into products very quickly: wood-to-chairs, thread-to-cloth, tomatoes-to-tomato paste, iron-to-steel… They work much faster than people, so the prices of all kinds of goods plummeted, which enabled more people to afford them. When people make things, fingers only move so fast, so productivity is constrained. Due to our vast success with mechanization and standardization, we have applied the product (and brand) model to everything possible. We try to “productize” services to squeeze out more productivity. We create standardized business processes, too. However, we are encountering several problems that signal a significant correction of the product phenomenon. As I predicted in 2006, the Industrial Economy is currently being subjugated by the Knowledge Economy. However, the oversupply problem is compounding fast. Since the 1990s, financial liberalization and digital communications have globalized supply and demand and facilitated the growth of truly global markets. Customers can buy online via the web due to the Internet and liberalized financial systems. As each market’s productivity increases, it focuses on exports, so the producer-consumer imbalance is accelerating very quickly. There’s no “abroad” any more. Western CEOs and CMOs look at India and China as “huge new markets” for their products, but any success they have will be short-lived. China and India will be exporters extraordinaire for sophisticated products and services in every category. Mechanization will enable them to create oversupply very quickly. By definition, “services” are intangible, so machines’ ability to deliver services has been limited. Only services that are very simple have been mechanized (automated teller machines, car washes). The services of dentists, dry cleaners, dog groomers, etc. have been too complex for machines to handle. Smart machines will push the envelope here, but when these efforts succeed in mechanizing services, their value will fall fast, for the same reasons products’ has. The marketing profession coalesced during the 20th century to address early vestiges of oversupply. Henry Ford could only have made his famous quote (see #3) in 1909, when demand was virtually unlimited. In the United States, which was unperturbed by two wars that ravaged the world’s most industrialized economies, production increasingly outstripped consumption, especially after World War II. Marketing had to “give products personality” by placing adverts in (controlled) mass media. Marketing mechanized “the four Ps” everywhere, but today it has decreasing impact. People are oversaturated by products and messages that try to create differentiation where there is often little. Marketing is not the problem; products are commodities and people are jaded. Marketing can transform by nurturing people’s conversations about what they want to do with products. Marketers are very familiar with the concept of an “ingredient brand.” Do you realize that, for most people, products are “ingredient experiences?” Few people like to buy products; rather, they buy the effect they can create with the product. This is where the puck is going, so marketers need to help people have experiences. Mass customization will enable a new level of intimacy between maker (erstwhile producer) and user (erstwhile consumer). For more on this, see Post-Product Marketing and Engagement. Although I’m not an economist, I have noted, observed and been writing about the waning of the Industrial Economy since Web 1.0. I don’t believe we have a “bad economy” today. We have a different economy that I call the Knowledge Economy. The Industrial Economy has been producing diminishing wealth since the 1970s, depending on the country. Financial wizards have been playing with the numbers for decades, voters and politicians have been too happy to accommodate, and everyone is getting the all-too-predictable comeuppance. The “economy” is transforming, but government leaders and most business executives don’t understand that yet. They keep lamenting that the butterfly isn’t a caterpillar. The Knowledge Economy will be much more fun and will create unprecedented wealth, once people learn its rules. Marketing is on the front lines here because its role is to “create excitement.” Social technologies are enabling people to get involved with everything, in innumerable ways. They increasingly want to. So it’s not important that you hired a celebrity chef to create the barbeque sauce, it’s more important that a group of enthusiasts were able to create the recipe, and you make their recipe. This is where products are going. The capacity for innovation is unlimited when you get the crowd involved. When I talk about this, eyes roll. The main objection is, “Get real; people don’t have time to co-create barbeque sauce recipes.” They are right that most people do not, but that misses the point. The law of online participation is, most people are lurkers, they like to observe, and they are content to know that they could have done it but didn’t choose to. And lurkers feel some sense of ownership over the sauce, too. They are influenced by what they observe. The first step in realizing the future is to de-productize and de-customerize your thinking, which is inculcated with the reality that “we have product that we have to move.” Machines build products that are not for anyone in particular, although their design is often meant to be most relevant to certain demographics. This legacy thinking is dangerously out of place in the 21st century in which impersonal products have rapidly diminishing value. Change your team’s focus from product features to users’ experiences. Traditionally, producers’ key goal in interacting with “consumers” was to encourage them to buy more. Minimal or no attention was paid to the “user experience,” what people did with the product. I forsake “consumer” and “customer” for “user” to mark this shift in thinking. Your firm/brand/product team can collaborate with users to help them create unusual value with your “product.” Realizing this potential starts with your commitment to user experience. Start by using digital social venues to locate, observe and nurture unusually relevant conversations. Social venues are extremely efficient for helping people to introduce, surface, promote and expand conversations. Since social venues are usually asynchronous, they are highly efficient and enable several participant roles (see Ladder of Participation). Remember, your team’s focus is now on helping people create meaningful outcomes with your “product.” By the way, you can do this even if your product is highly commoditized like fasteners, toothpaste or toilet paper. Get involved in conversations in which these products play very important roles or in which the impact of minuscule product differences is great. To make this work, you need to be grounded in the user’s true experience, not what your team wants it to be. When you listen to users talking among themselves, you will understand the difference; it’s what people say when you’re not in the room. Your adoption of the Social Channel of Value depends on what your company makes, your business structure and many other variables, but for our purposes here, two stages involve the back end. Adoption almost always starts in the front end as described above. After you have engaged users in social venues for a while, you will have learned numerous insights about how people are using your product (“use cases”). You will have encouraged some of your firm’s experts to interact with users, which will have improved their ability to innovate. Your increased communication with users and insights into the results they want will naturally lead to evolving the products themselves and/or elements of procuring, servicing or maintaining the products (which your firm may also do). The first step in back end innovation probably involves your policies or terms of using the product (B2B firms)—or packaging, pricing, green initiatives, etc. (B2C firms). Of course, we are assuming that making changes to policy is easier than make changes in product specifications. The first step is accommodating users by making changes that will be valuable to them and have least impact on your business operations. The second step in back end innovation is changing the product(s) based on interactions with users. Note that, by now, you have already built a support group in social venues. You can introduce and test ideas before changing the policy or making other changes. You can create pilot programs for more (administrative/servicing/product) features. Remember, the community of people you access in one or multiple social venues may be hundreds or thousands of people, possibly millions. Your R&D team may have ideas it wants to vet with people in social venues. Update: Knowledge Economy Products describes how empowered users and people are beginning to redefine manufacturing. This is analogous to how “the rest of us” changed mass media, and it is coming to products. An advanced stage of the second step is starting and supporting conversations about user experience in which you solicit ideas for new products, and these conversations are grounded in user experience. When you know how to build and grow online conversations, you combine your engineering, product, marketing and service experts with the most knowledgeable users and can innovate much more quickly than any competitor. This can evolve into users designing products (again, the way this happens depends largely on the product you have and your users). Lastly, it may be appropriate for your to build a private social network using a white label solution. We don’t advise doing this unless your assessment is that the venues in which conversations are happening don’t provide the right features or community benefits to let conversations fully flourish. We almost always recommend using private groups or blogs first to test your assumptions. We have covered three centuries. What do you think about the post-product world?